Sean E. Matheny, DDS, Inc. If you have lost some or all of your natural teeth, dentures can replace the teeth that are missing and improve your quality of life. With a little practice, dentures can make eating and speaking easier. You can smile freely without feeling embarrassed. Dentures can be made to look like your natural teeth. There may be only a small change in how you look. Full dentures may even give you a better smile. Dentures also support your cheeks and lips so the face muscles do not sag and make you look older. 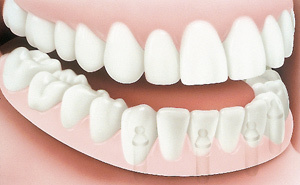 Complete dentures have replacement teeth fitted into an acrylic base. The base is made to closely match the color of your gums. If you still have some natural teeth, they will be removed before your dentures are placed. A complete denture may also be attached to dental implants, which provide a more secure fit. 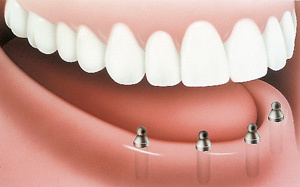 Implants are posts that are surgically placed in the upper or lower jaw. Properly placed implants make the denture stable and can help reduce bone loss. Many patients find that implant-supported dentures are more comfortable and secure than conventional complete dentures. However, not everyone can get implants. Patients must be in good health and have enough bone to support the implants. Ask your dentist if you are a good candidate for dental implants. Some patients may have the option to get immediate dentures. These dentures are made before the remaining teeth are removed. Once the denture has been made at the lab and is ready for you at your dentist's office, the dentist removes your teeth and the denture is placed right away. With immediate dentures, you do not have to go without teeth during the healing time after your teeth are removed. Healing can take several months. Once healing is complete, the dentures may need to be adjusted or relined. Sometimes a new denture needs to be made. A conventional complete denture is made and placed in your mouth after the teeth are taken out and the tissues have healed. Healing may take several months. The base of the upper denture covers the palate (the roof of the mouth). When the base of the upper denture rests against your gums and palate, it makes a seal to hold the denture in place. 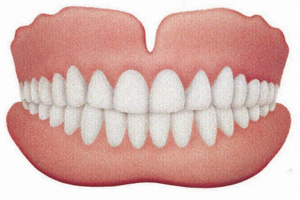 The lower denture has a horseshoe shape so there is room for your tongue and its muscle attachments. It rests on the gum and bone tissues of the dental ridge. Your cheek muscles and tongue also help hold the lower denture in place. New dentures may feel odd or uncomfortable for the first few weeks. This is normal. Keep wearing your dentures until you get used to them. The lower one may feel especially loose until the muscles of your cheeks and tongue learn to hold it in place. You may have extra saliva for a short time. Some soreness should be expected for the first week or two. Your dentist will check on your progress and make any adjustments needed to make you more comfortable. • Begin by eating soft foods cut into small pieces. • Chew on both sides of the mouth to keep the pressure even. Avoid biting on the front teeth. • Do not eat very sticky or hard foods or chew gum. You will also need to practice talking with your new dentures. Try reading out loud and repeating tricky words in front of a mirror. Talk slowly to avoid mumbling or muffled speech. If your dentures slip out of place when you laugh, cough, or smile, bite down and swallow to reposition them. When you get new dentures, your dentist may tell you to wear them most of the time. After the adjustment period, dentures should not be worn 24 hours a day. Your dentist may tell you to take out the denture at bedtime and put it back in when you wake up. Do not wear dentures around the clock because it can cause your mouth to be irritated. Your new dentures should fit securely, but the dentist may tell you to use a denture adhesive as you get used to wearing them. A denture that does not fit well may cause irritation, mouth sores and infection. While denture adhesive can help a loose-fitting denture for a short time, using adhesives all the time is not recommended. If your denture is loose, have your dentist check it. If you are using an adhesive, make sure you follow the instructions for use. • Clean your denture each day. Take it out of your mouth and carefully rinse off loose food particles. Wet your denture brush and put the denture cleaner on it. Also, brush all the surfaces gently to keep from damaging the plastic base. • Your denture is very delicate and can break if dropped even a few inches on a hard surface. Clean your denture over a folded towel or a sink filled with cool water. • It is best to use a special brush made for cleaning dentures, but you can use a toothbrush with soft bristles. Do not use hard-bristled brushes because they can damage dentures. • A liquid soap can also be very effective when used with a denture brush. However, you should not use toothpaste to clean your denture. Some toothpastes have abrasive particles that can damage the denture base and teeth. Do not clean your denture with bleach. • Rinse your denture well after using any denture cleanser or liquid. They may contain chemicals that are not intended to go into the mouth. • Look for denture cleansers and products with the American Dental Association Seal of Acceptance, a symbol of safety and effectiveness. • Keep your denture in water when you are not wearing it. Do not let it dry out or it can lose its shape. • Your dentist can tell you how to care for your denture and if you should use a denture soaking solution. • Keep your denture away from curious children and pets when you are not wearing it. Even if you wear full dentures, you still must take good care of your mouth. Brush your gums, tongue, and palate every morning with a soft-bristled brush before you put in your dentures. This increases circulation in the tissues in your mouth and helps keep them healthy. Eating a balanced diet is also important to keep you and your mouth healthy. You will still need regular oral exams by your dentist even if you have no natural teeth. The dental office will tell you how often you should have dental visits. During a visit, the dentist will look for signs of disease such as cancer of the head and neck. Your dentist will also check to see if your dentures fit well or might need adjustments. See your dentist if your dentures break, crack, chip, or if the denture starts to feel loose. Your dentist is the only one who should make repairs to your dentures. A person without the proper training will not be able to fix a denture. Do not try to adjust them yourself. This can harm both the denture and your health. Do not use over-the-counter reline materials or glues on your denture. They may contain harmful chemicals and are not a long-term solution for fixing it. The normal lifetime of dentures is about 5 to 10 years, but this can vary widely depending on the patient. Your gum line and dental ridge will continue to change in shape and shrink even if you do not have natural teeth anymore. Over time, dentures may need relining, rebasing, or replacing. Relining is when the dentist adds new material to the underside of the denture base to fit to your gums. This could be either a hard or soft material depending on the condition and sensitivity of your gums. Rebasing is when a new base is made using the existing denture as a model. The artificial teeth from the old denture are used on the new base. The mouth changes naturally with age. Jaws may line up differently as bones and gum ridges recede and shrink. At some point your dentures will no longer fit well and they will have to be remade. It is important to replace worn or ill-fitting dentures before they cause problems. Your dentist will let you know when it is time to replace your dentures. • Give yourself plenty of time to get used to your dentures. • Eat a balanced diet for good health. • Practice eating and speaking with your denture. • See your dentist regularly. Patient education content ©2019 American Dental Association. All rights reserved. "ADA" and the "ADA" Logo are registered trademarks of the American Dental Association.